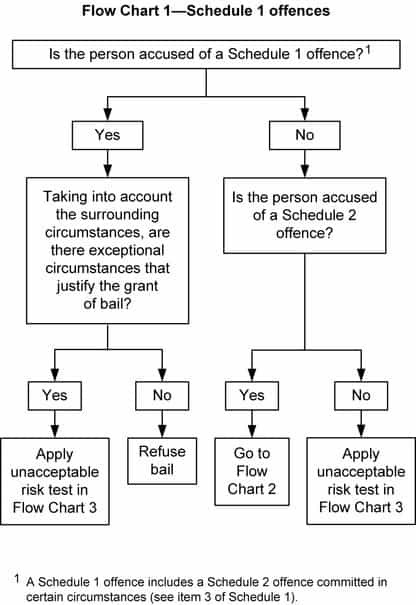 If a person is charged with Schedule 1 offence, he/she must demonstrate that exceptional circumstances exist which justify the granting of bail. e) while released under a parole order made in respect of any Schedule 1 offence or Schedule 2 offence. An offence against section 77B of the Crimes Act 1958(aggravated home invasion). An offence against section 79A of the Crimes Act 1958(aggravated carjacking). e) section 79(1) (conspiracy) in circumstances where the conspiracy is to commit an offence referred to in paragraph (a), (b), (c) or (d). i) section 79(1) (conspiracy) in circumstances where the conspiracy is to commit an offence referred to in paragraph (a) or (b). 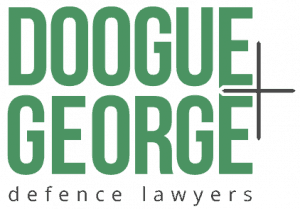 An offence against section 302.2, 302.3, 303.4, 303.5, 304.1, 304.2, 305.3 or 305.4 of the Criminal Code of the Commonwealth in circumstances where the offence is committed in relation to a substance in respect of a quantity that is not less than the commercial quantity (as defined in section 70(1) of the Drugs, Poisons and Controlled Substances Act 1981) applicable to the drug of dependence as defined in that Act constituted by that substance. An offence against section 307.1, 307.2, 307.5, 307.6, 307.8 or 307.9 of the Criminal Code of the Commonwealth in circumstances where the offence is committed in relation to a substance in respect of a quantity that is not less than the commercial quantity (as defined in section 70(1) of the Drugs, Poisons and Controlled Substances Act 1981 ) applicable to the drugof dependence as defined in that Act constituted by that substance. An offence under section 231(1), 233A or 233B(1) of the Customs Act 1901 of the Commonwealth (as in force immediately before the commencement of the Law and Justice Legislation Amendment (Serious Drug Offences and Other Measures) Act 2005 of the Commonwealth) in circumstances where the offence is committed in relation to narcotic goods within the meaning of that Act in respect of a quantity that is not less than the commercial quantity (as defined in section 70(1) of the Drugs, Poisons and Controlled Substances Act 1981 ) applicable to the drug of dependenceas defined in that Act constituted by those narcotic goods. An offence against section 4B(1) or 21W of the Terrorism (Community Protection) Act 2003 . Assembly for unlawful purposes where two or more assemble with the intention of importing or smuggling prohibited goods, or assemble to prevent the seizure, or rescuing after seizure, of any prohibited imports or smuggled goods (section 231(1) Customs Act 1901 (Cth). The master of a ship or the pilot of an aircraft, intentionally use the ship or aircraft to smuggle, import or export any goods in contravention of the Customs Act (section 233A Customs Act 1901 (Cth)). Section 233B(1) of the Customs Act as it was in force until 6 December 2005 when the Law and Justice Legislation Amendment (Serious Drug Offences and Other Measures) Act 2005 (Cth) commenced and repealed section 233B. An offence under section 233B(1) will only be a Schedule 1 offence where the offence is committed in relation to a commercial quantity of narcotic goods.